Since at the age of six Moema used to dream of a boy with Caucasian appearance which his mannerisms were so familiar to her. 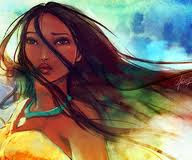 She was the fourth and the youngest daughter of the tribe’s chief, so-called Apurinâ. They lived at the north of Amazon River. Known as one of the most withdrawn and isolated tribes of all modern civilizations. Contact with “white man” was just reported and consolidated in stories and legends. At their meeting, around the campfire, Moema’s grandmother used to tell mysterious and fascinating tales. Many of these stories were about possible visits of weird beings, coming from unexplored and unknown worlds. Moema, a very smart and curious indian girl was interested and delighted in listening to these tales. She tried to materialize in her imagination a likely unknown world. One day, at a Shamanism aboriginal ritual, with a contemplative and softened voice tone, Moema narrated to her closest friend, Iracema. - hum! That´s cool! However it is so hard to identify when you´re not dreaming away! - This time it seemed so serious…hum…perhaps clearer. I may admit that I´m a daydreaming and that the presence of someone persists in all my dreams, but I´ve never dreamed with so much intensity. - It is with that same boy? One you said he was so strange? One that is quite similar to the myths your grandma tells? - Yes…exactly the same. And I think that I´ve been dreaming about the so-called “white man” as my grandma describes it. - Hum! Is it?....well!...then how can you dream about someone you´ve never sow before in all your existence? - Yeah!... good question!...I have no plausible answers. However, having all the mystic legacy of our tribe, we can find it! - Probably. But could you describe this dream in details? Were you also acting in it or were you just an observer? Moema finally managed to arouse the attention and interest of her friend. Taken by a state of deep introspection, Moema, thoughtful and confusing, got lost of the dialogue. Her father, the cacique, realizing the absent-mindedness of his daughter, thought it was happening a natural change. After all, Moema was no longer a child and whereas that her marriage had been premeditated since her birth, she may be reflecting about it. - Right there on the mountains of the forest, lying at the north of the river, among so many beauties of uncountable faunas… I was watching the jaguars that stalked their prey, when suddenly I saw him. - So….? What is he like? What was he doing? Keep telling! - He was wearing an unusual dressing that I´ve never seen before! With a very strange thing at the top of his head. He had the hair like the sunlight king; his eyes were like the immensity of the ocean. His skin shined with the touch of the king overshadowing my vision. - Wow! What a thrill! I even shivered all over! Actually the given description is pretty similar to your grandma stories. The most coherent answer would be that as you´re so dreamy and fanciful, you were the one who went beyond. You saw and imagined the “white man” exactly as they tell. - Moema! What happened to you? You and your friend did not pay attention to the ritual. You better observe and participate in order to learn how to apply the healing technics. - Dad! I was reporting the dream I had about the supposed white man. Full of irony, her father repudiated her dream. - There´s no white man! You even don´t know if they truly exist! - But dad, grandma says so. And I saw him just like she describes him. Could I consult the shaman to know if there is any explanation for these dreams? -I´ve said already no! this can be dangerous! We cannot conjure spirits for useless and Childish whims. The Indian girl started crying. She regretted the severity and emotionless in which his father has treated her intimacy and mystery. - That transparent light bird which you´ve contemplated and still sees in your visions…is your soul mate. The past reincarnation of your current fiancé. - If thus, why are they so bodily different? And plus: why I haven´t never felt that delightful feeling with my current fiancé as I felt with the one of my dream? The so clever Shaman, did not want to mess up the marriage of his unfortunate son and put him into humiliation for being rejected by his promised bride. He diverted the truth, the one that the spirits had in fact revealed him. Nevertheless, Moema never gave it up, she remained loyal to her heart. At the large mountains with dense trees, an extensive chlorophyll which devoured the whole territory; the sun emerging from a leonine yellow into a red orange, on its daily journey, was setting on the skyline. In this beautiful sunset, a day before her marriage, at such a contemplative moment, Moema was full of doubts and enigmas. She stared down at her reflection on the river, the sun saying good-bye. The languid and splendid moon in all its entire exuberance, was flaunted in the sky saying hello at her arrival. So shining, limpid and melancholically nostalgic. The river licking the reflection projected but the moon, formed a path through the flowing water. After a moment with her eyes closed, a sudden feeling of ecstasy invaded her heart, then she heard a voice that rang like a soft song, so sweet that has sensually seduced her. - Hey beautiful young lady! What are you doing here at this time? Being so shy and elusive, Moema abruptly turned her away and she could not understand his language, however she comprehended him with the language of soul. When she looked up, she faced with the young man of her dreams. Love at first sight. They looked at each other with star sparks that flashed from their eyes. Magnificently Close-conceived. He was the son of a colonizer of that lands, still an uninhabited area, but with so many mysteries and idyllic beauties that irradiated love, romance and everything that is heavenly and extraordinary. Despite all the problems they had to face, the original couple has consolidated their love, not only in their feeling but also in life together. They ran away, crossed the sea and raised a wonderful family.